The mist-kissed air inspires a craving for a delicious cup of hot chocolate. Here are our top picks in the city. Well-known for their hot chocolate, this cafe serves a range of hot chocolates from classic to orange, rose and spiced. Made with just cream and chocolate, this is a cuppa full of goodness. You can never go wrong with Starbucks. Indulge in their delicious signature hot chocolate which is available in four sizes and will leave you wanting for more. This cafe is a haven for chocolate connoisseurs. Their Italian hot chocolate comes in a variety of flavours including classic, mint, caramel, dark, hazelnut, tiramisu, Belgium chilli (our favourite) and strawberry. This cutesy cafe, while serving all things sinful, does some great hot chocolate. We recommend you to try their signature dark chocolate which will leave you with a smile. Pesto Pesto serves various flavours of hot chocolate including classic, orange and mint. What stole our hearts is their hot chocolate spiked with red wine. Fat Cat's Cafe serves some delicious hot chocolate. 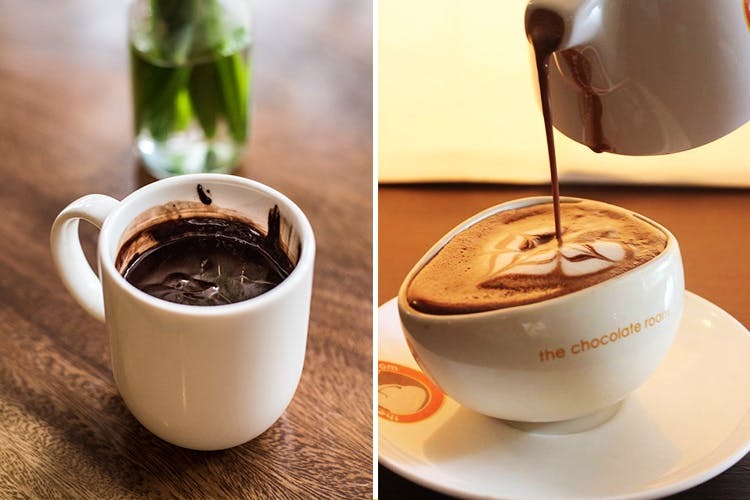 What more could you want this monsoon than to enjoy a steaming cup of gooey chocolate? Bonus: Pick your favourite book from the cafe's collection. Along with all the baked and savoury delights, the tall glass of hot chocolate is an absolute delight. The best part about the place? You can bring your pets too!